The music of this game is very sticky and one of my strongest memories of the Atari 800XL. It was also a lot of fun to play, and one of the games I played the most indeed. Always loved the music of this game and remember it to this day. The number of moves and attacks was great. 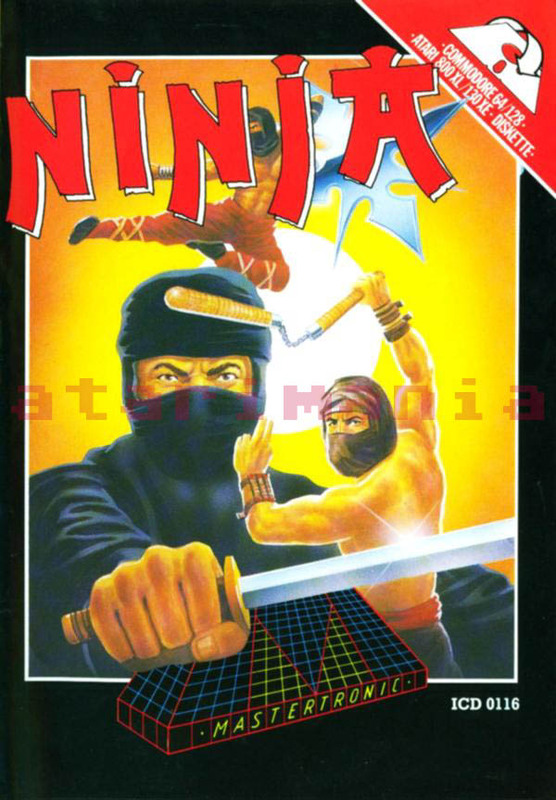 To me, better than Karateka even if it was easy to know how to beat after playing it. Finished this game on the emulator without cheating. Rather difficult. I loved it when I was younger, but it was too frustrating. I never forgot the music! On the inlay card, the bottom right screenshot... it has a trap door in the floor, which isn't on the other screenshots of that scene. Any ideas? A great game. Playing it now brings back a lot of happy memories. For a budget game this was very good. I played it a lot. Tip: Each time you enter a room, the daggers/stars that are not held by someone are repositioned. So by entering and leaving the room several times, you can easily pick them up and destroy enemies from a distance making the game not that difficult. Downloading a .zip file is no different from downloading any other file. You just save it to wherever you want to have it on your hard drive. When you want to play the game, unzip the file by right-clicking on it and selecting "Extract All". The file will then be unzipped. You can then delete the old zipped file that you don't need any more. 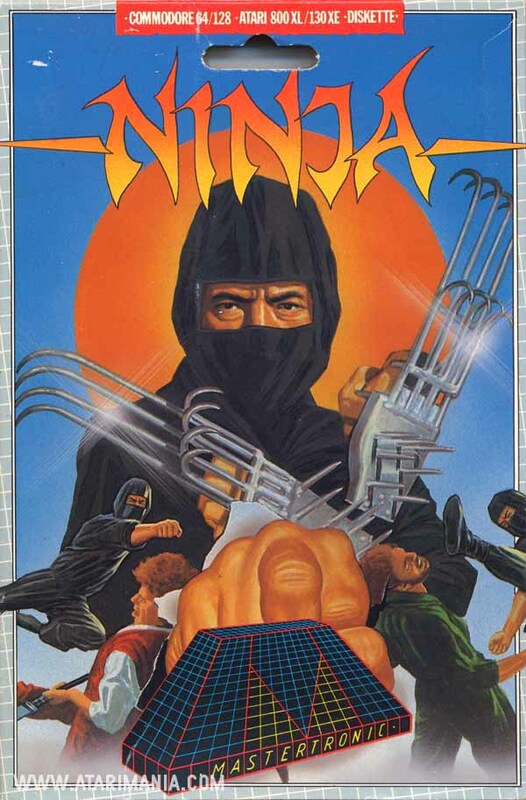 I loved this game but i was too young to complete it. 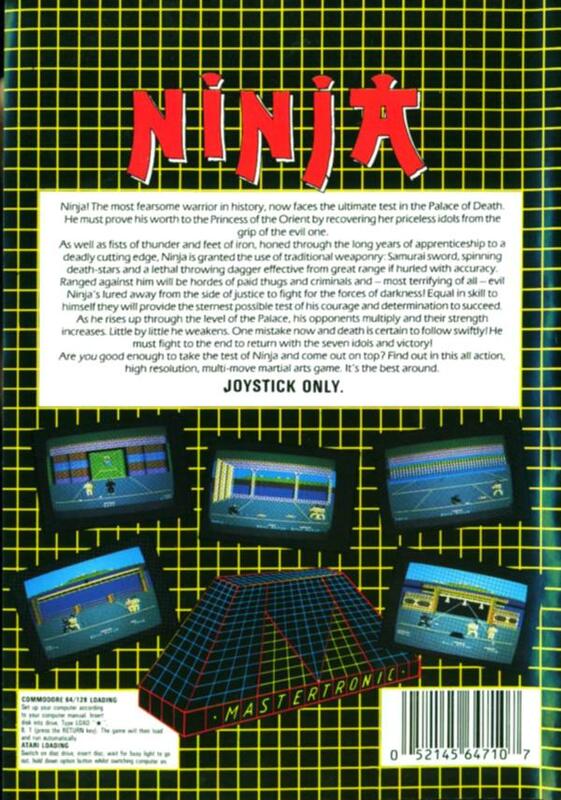 I always got to a room with like five ninjas and got killed! Still remembering waiting the 13 minutes this game took to load! Great game for the money. Good music and graphics, slightly limited gameplay, still excellent fun! Pretty good game for the money with nice graphics. 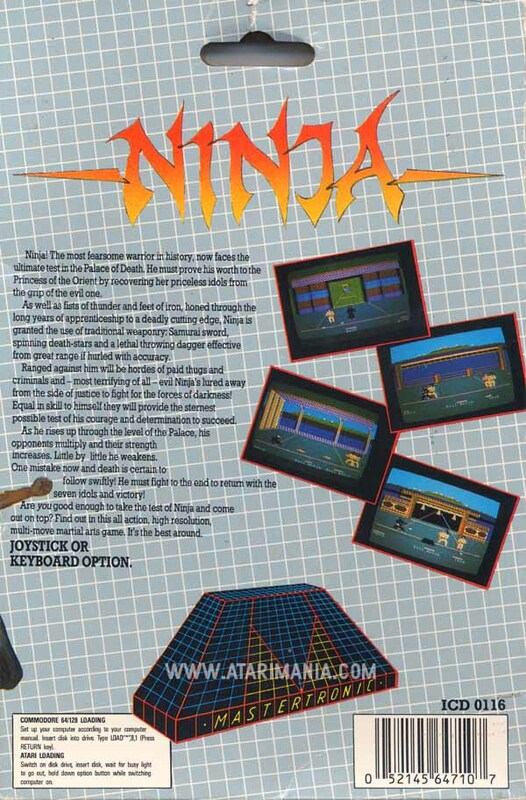 The fighting was fairly simple (kick thugs, kick karatekas more, avoid direct contact with evil Ninjas... I never used my sword!). Main drawback was that once you'd completed it, it was fairly easy to do it over and over again. 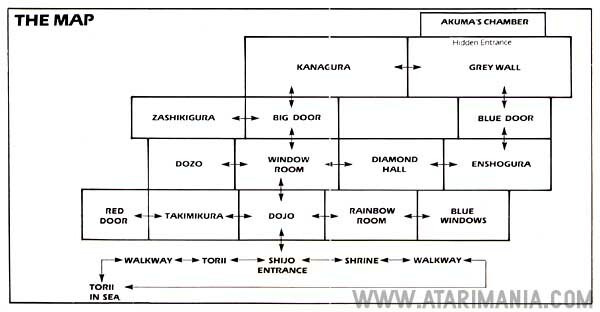 If I remember correctly, I used to be able to do the whole game in four or five minutes flat- collect all the idols, kick the baddies to pieces, "rescue the princess" (you never saw her) and return to the starting location. First game I ever got around to completing - used to get up early to get 30 mins in before the old paper round - great times! 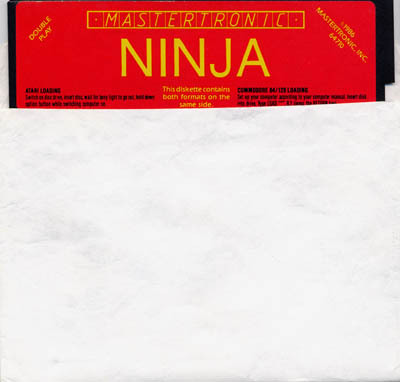 Steve Coleman wrote some games I loved on the Atari - Pharoah's Curse, Rainbow Walker and this, Ninja. It's got pretty graphics, good tunes but slightly repetitive gameplay and limited moves. Still, as a budget release this is a fun game.